disadvantages, too. One is, with a popular public-domain work, he isn't likely to be the first to animate it. Even Snow White was anticipated by Fleischer's version of the story, starring Betty Boop. Aladdin was first animated by Fleischer, who co-starred him with Koko the Clown. Next, he was done by Disney's long-time associate, Ub Iwerks, during the brief period when Iwerks ran his own studio, producing such properties as Flip the Frog and Willie Whopper. He was also animated in Britain by Lotte Reiniger of Primrose Productions, who used an unusual cut-out silhouette style of animation. And he was done numerous times in live-action, starting as far back as the late 19th century. But once Disney released its version, on November 25. 1992 (after a premiere on the 11th), non-Disney Aladdins tended not to be produced anymore. The Disney version became the definitive one, filling almost the entire market for Hollywood Aladdins. This film marked something of a departure for Disney's studio. Previously, Disney feature protagonists, like Cinderella and Peter Pan, had been lily-white, at least when they'd been human at all (cf. Lady & the Tramp, Pinocchio, etc.). But Aladdin and his enamorata, Princess Jasmine, while not quite dusky-hued, had a decidedly Middle-Eastern look to them, complete with almost hooked, Arab-style noses. (While the story's original source was probably much farther to the East, it comes to us through the Arabian Nights.) Thus, Aladdin paved the way for later Disney features about non-Caucasians such as Mulan and Pocahontas. 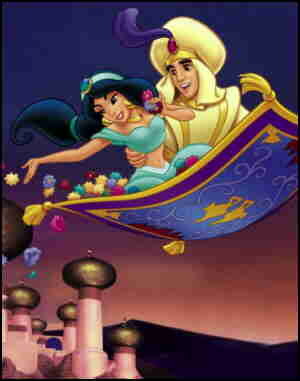 But real-life Arabs didn't necessarily see Aladdin as providing a positive image of their culture. In fact, a reference in the theme song to the regional practice of cutting off the hands of thieves had to be excised to placate protestors. Like several prior Disney features, such as The Jungle Book and The Sword in the Stone, this one employed the voice talents of actors not primarily known for their animation voice work. In fact, Aladdin himself was Scott Weinger, who is known for no other voice roles at all; and Jasmine was Linda Larkin, who also did only face acting other than a single role, Skye of Lynlorra, in the 2002 video game, Darkened Skye. Even Lea Salonga, who did Jasmin's singing voice, is known for face roles. But that movie has had enough sequels and spin-offs to provide minor voice careers from those roles alone. Not so with Robin Williams, who mostly turned the role of the Genie over to others for those sequels and spin-offs. But Williams also squeezed the role of Batty Koda in Ferngully: The Last Rainforest into his highly successful face acting career. Jonathan Freeman, the face actor who voiced the evil Grand Vizier Jafar in the original movie and over a dozen of its follow-ups, got his first voice role in Aladdin, but later played Eli Excelsior Pandarus in American Dragon: Jake Long. There were also a couple of pets. Aladdin's monkey, Abu, was played by Frank Welker, whose voice roles include such non-anthropomorphic non-humans as Jabberjaw, Buford and Jimmy Neutron's robot dog, Goddard. Jafar's parrot was Gilbert Gottfried, whose highly distinctive voice was also used for Superman's pesky enemy, Mr. Mxyzptlk, and the malovelent dentist Dr. Bender in Fairly OddParents. Other voices heard include Douglas Seale (Krebbs in The Rescuers Down Under) as the Sultan, Bruce Adler (also heard in Disney's Beauty & the Beast) as the narrator, and Jim Cummings (Darkwing Duck) as Razoul, the chief palace guard. Aside from the usual merchandising, the spin-offs started almost immediately, with video games. The first sequel, Aladdin II: The Return of Jafar, was on sale as home video only a year and a half later, on May 20, 1994 — in fact, it was the very first straight-to-video sequel to a Disney feature, a practice that's since become common. There have been other video sequels, as well as a half-hour TV show, which started September 5, 1994, Also, the characters have appeared several times on House of Mouse, the show where practically any Disney character, including ones that haven't been animated before, such as Li'l Bad Wolf and Super Goof, can turn up. Most of the actors reprised their roles in these appearances, but Williams was replaced as the Genie by Dan Castellaneta (Homer Simpson, Earthworm Jim). Aladdin has been firmly ensconced in the pantheon of folklore heroes for hundreds of years. Now, he and his supporting characters are firmly ensconced in the pantheon of Disney characters. Text ©2008-10 Donald D. Markstein. Art © Walt Disney Productions.